kennardphillipps presents Finnegans Woke at Rua Red, Tallaght. Pointing the finger at those in power, the exhibition speaks of the hypocrisy, greed and trauma that is driving world politics today. The exhibition is a call for civic engagement. Community-led work serves here as a platform to counter mainstream coverage. This process can be seen at Rua Red in a broader historical context, reminiscent of the possible cyclicity of history, explored by James Joyce in Finnegans Wake, 1939. The exhibition urges to learn from the past and stay alert to the social injustice in the making. This marks the fourth collaboration between a/political and Rua Red in partnership bringing some of the world’s foremost socially and politically engaged artists to Dublin. Cat Phillipps and Peter Kennard formed kennardphillipps in 2002 to protest against the allied British invasion of Iraq (2003), here recalled in the works Untitled (Iraq), 2005, Presidential Seal, 2006 and the iconic Photo Op, 2005. kennardphillipps stepped in to resist media propaganda playing an instrumental role in allowing the military intervention to move forward. The artists cut through layers of newspapers to reveal the perpetrators of contemporary horror. Their gallery of complicit world leaders has recently been joined by Theresa May and Donald Trump, the latter in Kill Story, 2018. Finnegans Woke is a rich body of work, featuring photomontages, prints, paintings and mixed media installations; centred around a monumental raft built by the artist as a symbol of civil resistance and the struggle for a better future. Rafts featured heavily in the press reporting on the desperate migration of people from the Middle East and North Africa. Its inclusion in the show is a welcome to the survivors of such journeys who now live in Tallaght and the surrounding county. The raft is ringed by one hundred and seven anonymous portraits: Untitled Men in Suits, 2018, an embodiment of the bureaucratic systems perpetuating power. 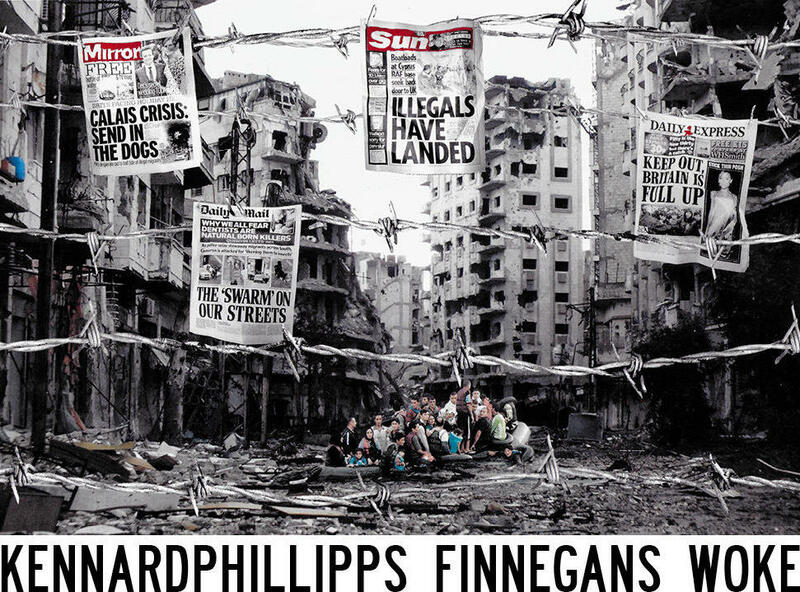 kennardphillipps is a collaboration between Peter Kennard and Cat Phillipps, working since 2002 to produce art in response to the invasion of Iraq. It has evolved to confront power and war across the globe. 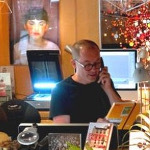 The work is made for the street, the gallery, the web, newspapers & magazines, and to lead workshops that develop peoples’ skills and help them express their thoughts on what’s happening in the world through visual means. The work is made as a critical tool that connects to international movements for social and political change.